After signing up with Facebook, a wizard science algorithm will expelliarmus through your and your friends' social networks in search of compatible matches that are equally into The Sisterhood of the Traveling Pants, but're far enough removed from your cadre that you most likely haven't previously traveled into theirs. Then, each day at noon you'll receive an email showcasing one new person (along with select deets and which friends you share), at which point you'll be, like Belichick deciding between Chandler Jones and Dont'a Hightower, on the clock. 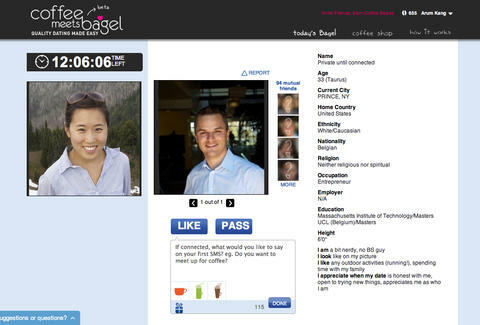 If you both choose "Like", you'll be connected via internal IM to go forth and coordinate a romantic midnight stroll through Eastie, but if either of you choose "Pass", you'll merely be connected via the Internet to another 24 hours of loneliness. To sweeten the deal and/or entice you to not suggest midnight strolls through Eastie, CBM also throws in incentives designed to induce actual dates like gratis beverages and desserts at spots around town including Espresso Royale, Cafe Vanille, and Finale, also what Wilt Chamberlain called it when he finally slept with every last woman in Italy.